Select a solitaire - A solitaire can be selected in many different ways, the most comprehensive of which offers a complete panorama of all solitaires. Both the typical layout of each solitaire at game start and the comments about the solitaire can be visualized. 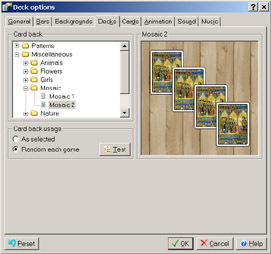 All the solitaire's features are shown as well. Comments - Comments about solitaires can be added, edited or deleted at will. A tool bar provides commands for text formatting and automatic insertion of data such as the current player's name, the current game number, the date and the time. Select a game - To each game is unambiguously related a game number, and vice versa. Each game number identifies a specific shuffle and thus uniquely determines a specific order of the cards. Solitaires can generate a million billion different shuffles for each solitaire, numbered from 1 to 999,999,999,999,999. Any of these game numbers can be selected. Game history - The current game history can be shown move by move. 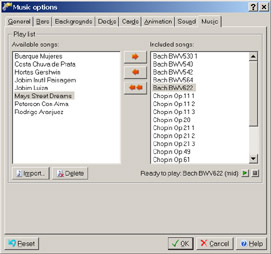 A tool bar provides commands to play the history back and forth. Game demo - The current game demo can be shown move by move as well. A tool bar provides commands to play the demo. Hint move - At any stage of a game, Solitaires can suggest a move by highlighting the appropriate layout part(s). Players - Players can be added, renamed or deleted. 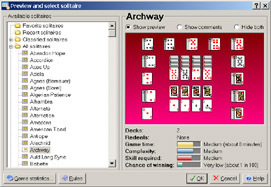 This allows games of any solitaire to be played in a competitive way. 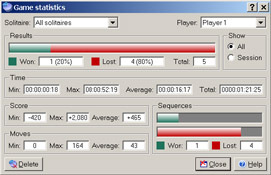 Statistics - Solitaires uses statistical analysis in many different ways and can show statistics relating to played games (game statistics), to players (player statistics) and to score progress (performances). In addition, it keeps track of all played games (games log), of highest scores (highest scores) and of average scores (global score). 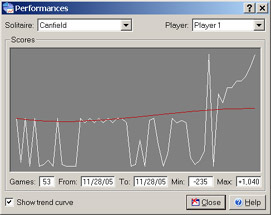 Game statistics, player statistics and performances feature attractive graphs. Card counter - The card counter is a small window that keeps track of all the cards in the tableau and in the stock, showing which cards are face up and which are face down. The card counter is updated at every move. Full screen mode - Games can be played in full screen mode. This feature may be handy when playing solitaires requiring a large play area. Card size - The card size can be automatically adapted to the current solitaire and to the current screen resolution. 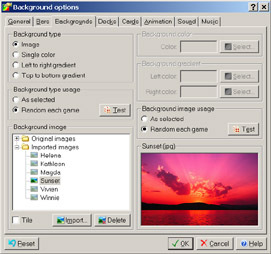 Alternatively, large, medium or small cards can be used regardless of the current solitaire and of the current screen resolution. In conjunction with the automatic scrolling feature, this greatly enhances flexibility and playability. Autoplay - Solitaires can automatically shift cards to the foundations every time such a shift is possible. Autoplay may be very handy and its use is highly recommended. Options - Solitaires can be thoroughly personalized by means of a wide range of options, covering topics such as general features, bars, backgrounds, decks, cards, animation, sound and music. Solitaires includes 40 background images, 39 card backs, 8 card sets, 20 sounds and 20 songs. More images and more songs can be imported. Music support - Solitaires fully supports MIDI, MP3 and WAV songs as background music, and features a play list that can be totally customized. The twenty included songs provide more than four hours of high quality music. Screen resolution and color depth - While exploiting all the features of Solitaires requires a high resolution screen with true color, standard (800 x 600 pixels) screens with high color are fully supported. Furthermore, even in this regard a high level of personalization can be achieved thanks to many sophisticated functions as automatic resizing, automatic scrolling and more.